Audi is very proud of the latest version of its very popular A4 line. They call it the “all-new” Audi A4 but if the phrase “all-new” conjures up mental images of something with five wheels or a peculiar cabin layout, don’t panic. This is still the Audi that we have known and loved for years, complete with the very best in German engineering, but it’s had a few tweaks and a bit of restyling to bring it up-to-date. When the A4 first came out back in 1994 (that’s over 20 years ago – well done, Audi! ), it was a rather bland-looking vehicle that was loosely based on the Volkswagen Passat. However, the new version of Audi A4 for 2016 looks a lot more exciting and has some features that hadn’t even been dreamed of when the original A4 came out (except in the minds of science fiction writers). Let’s start with the styling. The 2016 Audi A4 features some exciting tailoring that looks as crisp and stylish as a neatly pressed suit but a lot more dynamic. It’s got the angles on the front to give it a tiny hint of aggression and the side profile manages to look clean without looking bland. 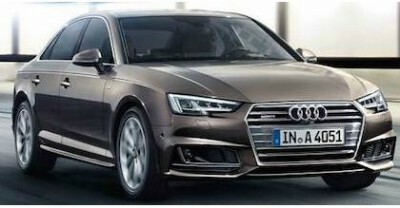 The front styling features one of Audi’s recent signature looks: LED headlights, which give clear white light with plenty of illumination and don’t dazzle oncoming drivers (unlike some Xenon units), all without draining the battery thanks to the low electricity demands of LED technology, which makes the 2016 Audi A4 more fuel-efficient. What’s more, the LED headlights and their complementary daytime running lights and rear lights all look gorgeous (another advantage of LED lights). Just in case these lights, which come as standard, aren’t enough, you can go for an optional upgrade to the headlight system that includes the motorway function (motorway function detects when you’re going at motorway speeds and increases the distance that the lights illuminate for increased safety). The alloy wheels (18 inches for the 1.4 TFSI and ordinary 2.0 TFSI; 19 inches for the 2.0 TDI Quattro and the 2.0 TFSI Quattro) also add interest and flair. The 2016 Audi A4 isn’t just a pretty face. With three engines and two drivetrains combining to make up four variants of the Audi A4 2016 Sedan, there’s plenty of power on tap, no matter which of them you choose. You also get seven-speed tiptronic transmission with all of the variants and steering wheel-mounted paddle shifters. Let’s start with the smallest of the range, the 1.4 TFSI. This 4-cylinder turbo petrol unit has been fitted out with direct fuel injection and Audi’s clever valvelift system, to say nothing of the best of what Audi’s engineering department has to offer. This unit is capable of putting out 110 kW of power in the 5000–6000 rpm range and 250 Nm of torque at a nice low 1500–3500. In practical terms, this means that the 1.4 TFSI variant of the 2016 Audi A4 has a top speed of 210 km/h and a 0–100 km/h sprint time of 8.5 seconds. The next option for the engine is the 2.0 TFSI, either with or without the Quattro drivetrain. This is another 4-cylinder turbo petrol with direct fuel injection and Audi’s valve lift system. In the “ordinary” version, you get 140 kW of power at 4200–6000 rpm and 320 Nm at 1450–5200 rpm; the Quattro manages 185 kW at 5000–6000 and 370 Nm at 1600–4500. Turned into speed and acceleration, the “ordinary” variant has a top speed of 240 km/h and a 7.3-second 0–100 km/h sprint time; in the Quattro, you get 250 km/h and 5.8 s respectively. However, if torque is what gets you salivating, then you are more likely to opt for the 4-cylinder common-rail direct injection turbodiesel 2.0 TDI Quattro, which has a whopping 400 Nm at 1750–3000 rpm, matched by the power output curve peaking at 140 kW in the 3800–4200 rpm range, adding up to a top speed of 235 km/h and a 0–100 km/h sprint time of 7.2 seconds. The fuel economy in the 2016 Audi A4 is also in keeping with modern trends towards minimal fuel consumption and a volte-face away from the old idea that a luxury car has to show that you’re well-heeled by burning lots and lots of fuel. The LED lights are just one component of the 2016 Audi A4’s ability to cut down on emissions. Others include the fine tuning of the engine, to say nothing of the stop/start engine control. The 1.4 TFSI may be the smallest but it doesn’t have the lowest fuel economy figures: it manages 5.5 L/100 km combined under test conditions; the honours for the most frugal variant go to the 2.0 TDI Quattro, which gets 4.6 L/100 km. The ordinary 2.0 TFSI posted 5.3 L/100 km and the 2.0 TFSI Quattro slurped through 6.3 L/100 km. Of course, these are test condition figures and if you drive the 2016 Audi A4 in the real world, you’re not going to get quite the same fuel economy. Attention assistance: this detects when you’re getting distracted and gives you an audible warning. City pre-sense: this has autonomous emergency braking, works at speeds up to 85 km/h and can detect oncoming collisions (or pedestrians) and can bring the speed down dramatically (reduces it by a maximum of 40 km/h, which means that if you were going at 85 km/h, it can get you down to 35 km/h). Rear pre-sensing: Detects something about to rear-end you or something that you’re about to back into. Exit assistance: warns you if there’s a car or cyclist approaching when you’re about to open the door. The cyclists of the world will thank you for this one. The 2016 Audi A4 also has a full stability package with torque control, ABS brakes, brake assistance, anti-slip regulation (ASR) and electronic differential locking (EDL). It’s also got cruise control, drive mode selection, hold assistance on slopes… and eight airbags strategically placed around the cabin. Another feature of the 2010s (what is the proper name for this decade?) is the ability to go online anywhere and everywhere, especially when we’re on the move (please don’t play Pokemon Go while you drive!). This is why the 2016 Audi A4 has the works: this goes a long way beyond just Bluetooth preparation. The infotainment and connectivity department in the 2016 Audi A4 features Audi Connect’s in-car Wifi hotspot and Google services (bring your own data), MMI navigation plus as standard (this includes an 8.3 high-resolution colour touchscreen, voice control, live traffic updates, 10 GB flash memory and the ability to select your favourites for the maps). This works in with the sound system, which takes just about everything you can imagine as input except cassette tapes (if anybody still has these around): radio, CD, DVD, auxiliary, SD card and USB, which allows you to stream certain apps (Audi’s official shorthand for Spotify, we guess) from Apple and Android phones. This provides good enough sounds via the regular sound system (which is a 180-W 10-speaker system in the top of the line 2.0 TFSI Quattro) but Audi’s proud to often a Bang and Olufsen optional extra that’s miles better than what you’ll find in many living rooms. Other creature comforts inside the 2016 include the sports-styled front seats, 3-zone automatic air conditioning and great ambient lighting (you can upgrade to the optional five-colour version) and light/rain sensing. There’s also a very wide range of options that you can go for if you want just a little bit extra; my pick would be for heated seats. About the only thing wrong with the new Audi A4 is that it has a space-saving spare tyre rather than a full-sized one. For any more information on the 2016 Audi A4, or for that matter any other new car, contact one of our friendly consultants on 1300 303 181. If you’d like some fleet discount pricing (yes even for private buyers! ), we can submit vehicle quotes requests out to our national network of Audi dealers and come back with pricing within 24 hours. Private Fleet – car buying made easy!